Ashley feels like Wendy Moira Angela Darling. And she needs your help. I’ve been doing a lot of thinking about San Francisco. Duh, right? I live here. But I came across an article that got me thinking a bit more about the city and its evolving relationship with its residents. Since I made the move to the Bay Area I’ve lived in the Outer Sunset, the South Bay, the Inner Richmond, Berkeley, the Mission, the Haight, the Outer Richmond, and then I made my way to Lower Pac Heights where I lived for over five years. Recently, I moved into Treasure Island. Along with sounding magical, it’s still considered a part of San Francisco. Even though sometimes, I feel like I’m outside it, watching the city lights from my bedroom window calling to me from across the bay. Ashley’s view from Treasure Island. She’s judging you. Yes, you. Thanks to The Huffington Post, this article struck me at an interesting time. Its entitled, Goodbye San Francisco, You’re a Passionate Lover. 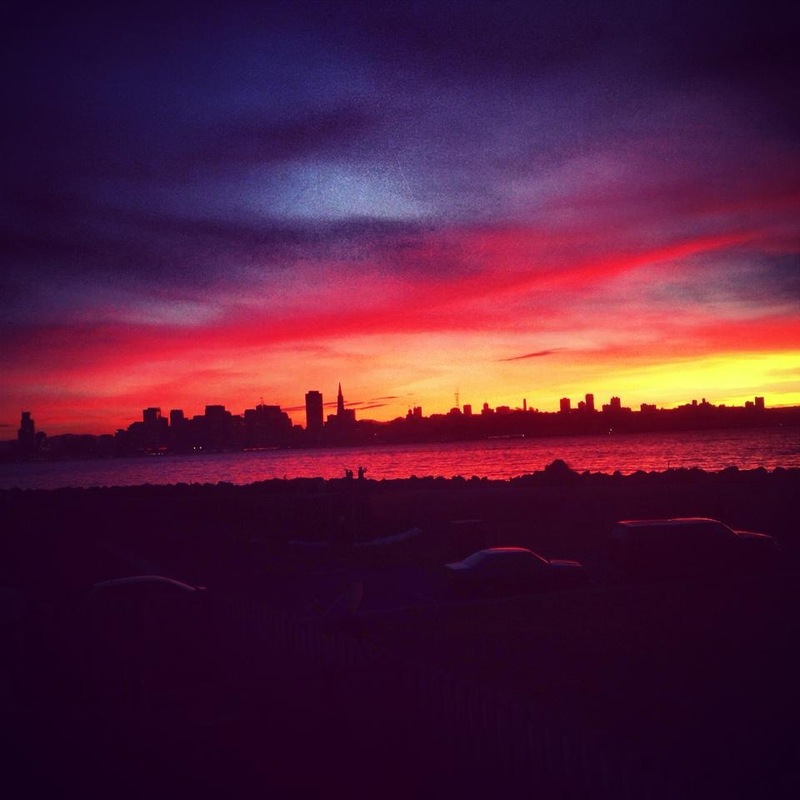 In it, Eric Barry bids a farewell to our city by the bay and expresses his feelings covering his last six and a half years here. Wait a minute. That’s the same length of time that I’ve been in San Francisco! I read on. Hold the phone, Eric! This is why I moved here! To be an artist, a writer, a musician. A teacher. A burrito enthusiast! I so desperately wanted to ignore that idea. But considering I found this article days after my own move, I couldn’t help but invite some of these ideas in while I sorted through boxes of memories my own past six years. Damn it. Is that true? San Francisco presents a changing landscape without the presence of time masked by seasons. Buildings sprout as frequently as the housing costs do and it’s hard to avoid the growing pains. And as much as I hate to admit it, this place has changed from the one I picked as a home. For starters, the Bay Area struggles with a displaced residents’ plea for help that’s getting harder to try and silence. Homelessness is up an alarming 20% since 2011 and food stamp usage and eviction rates are at a record high. And the divide becomes more apparent when you consider the 14,000 people who are bussed out to sunny Silicon Valley from our city streets to enjoy complimentary company snacks. Wait. I sound bitter. My apologies. I think I’m just frustrated. A perhaps a little sad. Those 14,000 people picked to live in this city like I did. Maybe they were drawn to the imaginative, open-minded, community based artists who kindly welcomed me. The ones who accepted me and helped me to survive on limited means because we nourished each other in different ways. Important ways. Or maybe they’re here because money can be a siren with song impossible to tune out. And, honestly, how can we blame them for seeking competitive wages for their modern abilities? I guess what hurts me is the reality that so many of us were magnetized to this area for the creative culture. The folks who offer their talents by lending a voice to a reading series, illustrating an original project, or producing a new piece without the hope of any financial reward. The ones who do it because they truly love it and wouldn’t be the same people without it. For me, the tech world seems to have drifted in like the fog; pretty from a distance but dangerous when you find you’re surrounded in it, unsure where the treasured things you’re familiar with are hiding. I worry the heart I’ll inevitably leave in San Francisco will just be replaced by a savvy emoticon. I’m grateful to have a home and food on my plate. But I’m someone who needs growth and development. And importantly, hope that my home can provide me with that. I want to live in San Francisco. But I’ve outgrown Never-Never Land. And I’m not interested in taking care of any more lost boys in the process. So I come to you, my friends, with a challenge. Because that’s what we do, right? We have to push each other to believe in our art and each other. What can we do to honor the place that may have called out to us for different reasons but urged us to stay together? How can we grow alongside the tall tech trees? I’m willing to fight if you are.